A.M. Did a mile time trial with Benjamin. The plan was to bridge the gap between his current track PR of 5:17 and the 5:00 barrier. To a great extent this was a psychological barrier. He had run 3:45 for 1200 already. But it is one thing to run 75s when you get to 600, you start to hurt, but you know you have only a lap and a half left, and to get to 600, hurt the same, and know that you have two laps and a half left. For Benjamin this is still a big deal mentally as he is only 13 years old. So I paced him through the first lap 76. Sensing a weakness, I eased off to 77. On the third lap he was supposed to take over. This was a trick to get him to focus better - the pain should feel less in the second lap when you are thinking about taking over in the third, and then in the third you feel responsible for the pace. But for some reason he did not take over. I assumed it was because he was struggling, and eased off to 80. I must admit I did not mind easing off to 80, as the earlier 76, 77 did not feel that comfortable. In the last lap Benjamin had a surprise for me. He took over and hit a 200 in 38. That was good. But then he kicked and ran the last 200 in 35. I could barely keep up. In fact, I tried to pass him in the home stretch but could not, and ended up a notch behind. So we ended up with 5:08.8, which is his new track PR. This was the full mile, not just 1600, so our lap splits do not add up. His last 1500 was 4:47. We ran some more miles, including 2 with Joseph. Jacob did 1, Julia and Jenny 2. Benjamin ended up with 6. I did a total of 12.3. A.M. Another time trial day. Ran to the Orem High track with Jenny, Benjamin, and Joseph. First, Benjamin and I paced Jenny and Joseph through an 800 meter time trial. Jenny got 3:08.3 with the splits of 96, 92. Joseph got 3:12.1 with the splits of 97, 95. Both got a PR, but the negative split shows that they both could run it faster, they just need to learn to not be afraid of a faster start. Then Benjamin and I raced each other in the 200. Benjamin edged me at the finish with 29.1 vs 29.3 for me. This was my fastest 200 in over a year, though, so I am happy I can still do 29.3. Then we ran back to the house, and Benjamin and I added 4 more miles to make it total of 7 for him. Julia ran 1 with Jacob, and 1 more herself - 2 total. I ran 5 more with the 4lb dumbbells. I am sensing when I run that I could possibly be smoother if my arms and shoulders did some magic to stabilize the torso. A normal runner does not need that, but given my L-4 defect, I need extra stability in odd places. Thus an experiment to see if running with the dumbbells will do anything other than just make me tired. Total of 12 miles for the day. A.M. Did 12 with Chad, then 7 with Benjamin, total of 19. Chad and I did an interesting tempo run on my 3 mile Provo Canyon Course going down. He started 1:00 ahead of me, then I was trying to catch him, and he was trying to not let me catch him. I went through the first mile in 5:13, and thought I was feeling good. Then I started feeling a little weak, but I still did a 79 quarter, 6:32 at 1.25. Then I felt even weaker, and slowed down to around 81-82 seconds per quarter pace. My second mile was 5:24. My next three quarters were 81, 82, 82. 82 did not feel too miserable actually, but I just could not go any faster. Then I saw Chad in the last quarter and was able to shift gears some to run 77, but it was too late. He finished 7 seconds ahead of me in 16:51, which is a very good time for him, and suggests that with proper marathon endurance he should be running Ogden/DesNews/Utah Valley type of course around 2:42. I got 15:59, which is not too terrible, but the splits suggested there was a problem. Based on how I felt after 5:13, this should have been something like 5:20, 5:18 afterwards - not 5:24, 5:22. Not sure what to make of it. This could be due to the fatigue from running 5 miles with dumbbells the day before, or could be some other form of fatigue. Jenny, Julia, and Joseph ran 2, Jacob did 1. Day of rest. Went to church. It was a Fast Sunday, so we had a Fast and Testimony Meeting. Then a lesson on the Fall of Adam in Sunday School, and a lesson on President Monson's message in the Ensign "The Savior's Call To Serve". A.M. Ran 7 with Benjamin, 2 alone, 2 with Jenny, Julia, and Joseph, and 1 more with Jenny and Jacob. Carried dumbbells in the last mile. Total of 12. Did a pickup for 600 in 1:56 down the canyon to catch up to Benjamin after a VPB. A.M. Repeated Saturday's 3 mile tempo to see if I would get better results without the 5 miles with dumbbells the day before. I did. The splits were 5:11, 5:18, 5:17, last quarter in 76, only one quarter slower than 80 (the first one in the last mile), and the total time of 15:46.3, which is my fastest time of the year. In the first mile I felt like I was holding back some and would be able to speed up in the second or third mile. But later on I felt I did not have another gear, not running alone at least. To a certain extent the feeling mirrored my Saturday experience, except I ran faster in every mile, slowed down less in the second, and my splits were dot on the . On Friday I tripped and thought that I had just bruised my arm, but later I realized I had bruised something in the rib cage as well, and have had a small difficulty breathing in all the way. I still felt it today. I suppose once that is healed I can measure what effect it had if any by doing this tempo run again. Total distance was 12.6 including 2 miles with the dumbbells. Jenny did 3, Julia 2, Joseph and Jacob 1. Benjamin was at the scout camp, was supposed to run 7. A.M. Today is the 20th anniversary of my baptism. When I was 12 years old I used to run a lot around a group of lakes in a park in Moscow. It was an interesting coincidence that 7 years later at the age of 19 I was baptized in one of those lakes. I cannot possibly describe the difference this change of direction 20 years ago has brought into my life. There are many things to mention, but here is one. Growing up I have overheard many people predict that I would never marry. They had their reasons, but they were looking at things through the eyes of the world, and not through the eyes of faith. In spite of a good measure of social awkwardness, or perhaps turning that weakness into strength, I was married within 3 months after returning from an LDS mission, and now after almost 16 years we are expecting our 8th child. Did a time trial with Julia and Jacob for 800 meters on the track. Joseph assisted with Jacob's time trial. The target for Jacob was to start out in 50 seconds for the first 200 and then hang on to dear life. Jacob ran the splits of 49, 53, 51 and 52 to finish in 3:25.6, which is a PR by 8 seconds, and the first time under 3:30. This gives us high hopes for the win in the Thanksgiving 800 as the course record for the times I've timed it is 3:28 and was set by Joseph last year. I would, however, feel more comfortable if he entered the race with a sub-3:15 PR, which he will probably have by Thanksgiving. Joseph ended up running 3:23. He was running in front. He forgot how fast Jacob was and thought that he could just comfortably coast through the whole deal. I had to prod him several times to speed up as Jacob several times almost ran into him. Then I paced Julia. Her target was also to go out at 50 seconds per 200 pace but it was more of a keep your head above water rather than a dream pace. Her splits were 47, 51, 51, 47 - total time 3:16.6 which is a 10 second PR. I was quite happy with that. This was a good step for her to get closer to breaking the 7:00 mile. At least it gives her the confidence that she can get to half-way on pace with good 10+ second margin from an all out 800. We ran a cool-down, so the total mileage was 1 for Jacob, 2 and for Julia and Joseph. Then we went home and I ran 3 with Jenny. Benjamin was supposed to run 7 at the Scout Camp. I ran 7 more to make the total 12 miles. P.M. William asked me if he could get a watch. I told him he had to break 2:15 in the 400 on the track without holding my hand. This was quite a challenge as his best is 2:21 with the hand, and he had not yet run the full 400 without holding a hand. But I knew that he needed to achieve this milestone if he had any hopes of winning the Thanksgiving 400 meter race (3-4 age division). He agreed, so I took all of the kids that were home to the track. William ran 2:25 with the splits of 33, 35, and then 1:17 for the last 200. He was running OK in the first 200, but then lost focus, it was not a matter of fitness. This was good progress, but he had not reached the goal that he had the fitness to reach. So I explained to him that he needed to try again. He almost got it in the second try. His first 100 was 29, then 34. I thought he had it in the bag, but then he tripped and took his time to get up. He still finished in 2:27, but he will have to try again to get the watch. Stephen was in a bad mood, but we decided to see what he could do for 100 meters. Normally the result for a 23 month old in that condition is DNF at best, otherwise DNS. However, somehow Jenny and Julia managed to dance in front of him making a lot of noise and he got through 100 in 46, which is his new record. I think right now he could crack 40 in better mood or with more bad mood fix practice. He needs to be in the low 30s to win the Thanksgiving 100 (0-2 age division). Then Joseph, Jacob, and Julia wanted to do timed sprints. First Julia raced Joseph. Joseph won, but his time got messed up. Julia got 19.6. Then I ran with them individually. Joseph got 19.0, Julia got 19.8. Then I ran with Jacob - he surprised me with 20.1. That is really good speed for a 6 year old! Maybe not that great for a sprinter, but definitely good for a distance runner. Then Joseph wanted to run 200. We did it in 39.8, which is his new record. I ended up with about a mile total of running. A.M. Ran with the kids. Jenny and Joseph did 3, Julia and Jacob 1. I added 9 more. Total of 12. Carried dumbbells for 1. A.M. Ran with the kids. Jenny did 3, Joseph and Julia 2, Jacob 1. Benjamin still at the Scout Camp, ran 6. I added 8 more to make the total 12. Did a pickup for 1.5 in 7:54.5 down the canyon, felt good. A.M. Ran the Provo River Half marathon in 1:14:48, 2nd place. 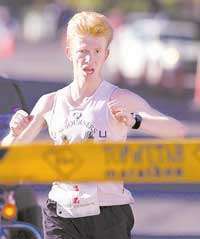 Jacob Buhler won with 1:07:15. I was hoping to run 1:11:30 based on my recent workouts and DesNews performance, but there was a problem I did not full appreciate the impact of. 8 days ago I fell and hurt my rib cage. I got up immediately, and shortly after ran a 200 with Benjamin in 29.3. The next day I ran my 3 mile course in 15:59, followed by 15:46 on Tuesday. So I thought this rib cage problem was no big deal. However today during the race it was giving me trouble. I opened with a 5:16 (according to Curt's mark, which I think was accurate), then it was 5:21. At this point I did feel restricted in breathing, but I did not yet need to breathe at super high volume yet, so it was somewhat tolerable. Then in the next two miles I gradually began to get more and more bothered by this problem. It was like Chinese water torture. It does not seem like a big deal, but one drop at a time you get to the point where it becomes unbearable. And I just did not have it in me today to push through it for the entire distance. So I settled on a compromise pace of about 5:45 and coasted/plodded to the finish. I managed to find some markers on the old highway that were placed every 100 meters, and timed what I believe was a mile in 6:27 going up into a headwind, which I thought was not too terrible for the day. On the way down I timed it as well, but I forgot what it was - something along the lines of 5:40. If it was close to 5:00 or under I would have remembered, but a 5:40 downhill/tailwind mile was not worth trying to remember precisely, I suppose, especially while I was dealing with the pain. Interestingly enough, on miles with less downhill I was still running around that pace - I think part of the problem was that the downhill was causing a lot of rib cage jarring, so it added the extra pain to take away from the advantage of the downhill. I timed my 3 mile tempo stretch, which on the race course maps to from about 9 to about 12. I ran that stretch in 17:14 with the splits of 5:40, 5:47, 5:47. My "official" 10 mile split was 57:01, which I remembered from the past years was at an accurate location. At that point I was not happy because I realized that a 17:00 5 K, which is under 5:30 pace would give me only 1:14 low, and it would take some painful work to stay above 1:15 barrier. Nevertheless, I made an effort to stay positive, and just do the best that I could under the circumstances. So I made my way to the finish, saw that I was cutting it close to not cracking 1:15 and sprinted just to be sure to stay on the right side of the 1:15:00 guy. I was rather surprised at the response I got out of my legs for the kick in the last 70 meters or so, but I suppose I should not have been surprised as they in all honesty have been vacationing all along as they could not get enough oxygen to work at top capacity. And oxygen is not needed for a 70 meter sprint. Afterwards I cooled down with Mike Epperson and Tony Vakaafi to make the total of 20 miles. Overall, I think this race was a good learning experience. Had everything been normal, I would have run a faster time, but I would not have learned about the importance of proper lung function in longer races. Of course, I knew that if your lungs were restricted you would not run 100%. But what I did not know is the difference in which it affects a longer race like a half marathon vs just 3 miles. Jenny ran 3, Julia and Joseph 2, Jacob 1. P.M. 0.5 with William. He ran a quarter in 2:19 down the Provo Canyon. Benjamin ran 7.5. Day of reset. Went to church. In the Sacrament Meeting we heard from a couple that just returned from a family history mission is Saudi Arabia of all places. They have been invited by the royal family to help digitize royal family records. Then we had a lesson on the Holy Ghost in Sunday School, and on ways to build God's Kingdom on the Earth in the Elder's Quorum. A.M. Did 7 with Benjamin, including 1.5 pickup in 8:23 down the Provo Canyon. 2 with Joseph. 3 with Jenny. Julia did 2. Jacob 1. Total of 12 miles for me. A.M. Benjamin and I paced Joseph in his 800 meter time trial. The target was to run the first lap in 90 and then survive. The idea was to teach him to overcome the fear of the 6:00 pace. This pace is quite formidable for a 7 year old. Joseph's splits were 44, 46, 49, 48 - 3:07.4, which is his new 800 meter record, and actually happens to be the family non-Benjamin/non-Daddy record by 1 second (Jenny had the previous record of 3:08), also the fastest Pachev time at the age of 7. He is on track for breaking 3:00 before the Thanksgiving race, which will put him in serious contention for the win in spite of having to race kids that are a year older. Afterwards we ran with the rest of the family. Jenny did 3, Julia 2, Jacob 1. Benjamin did 7. Benjamin and I did a pickup for 0.5 in 2:45 to catch up to Jenny and Julia. I ran some more, including 4 miles with weights to make the total 12 miles. A.M. Orem High coach Andy Jacobs invited Benjamin and I to join the cross country team for workouts some time ago, so we decided to check it out. We ran a little over a mile to Orem High, then 4 miles with the team, then a bit less than a mile of speed changes on grass, a pickup on the track to get an idea of how fast we were actually going in those speed changes (17.1 for 100 m), and a bit over a mile back. Total of 7. I was surprised that although we ran around 8:00 pace for only 4 miles a lot of boys were lagging. I was expecting either everybody to be comfortably running together at 7:30, or some aggressive kids ahead at 6:40 and the wiser ones back at 7:30. Jenny ran 3, Julia 2, Joseph 2, Jacob 1. I added whatever it took to make the total 12, including 3 miles with weights. A.M. 7 with Benjamin, Jenny did 3, Julia 2, Joseph 2, Jacob 1. Added 5 to make the total of 12, 3 with the weights. A.M. Had to get through the run fast. Ran the first 2 miles with Benjamin, then he turned around and supervised the runs of the other kids. Jenny did 3, Jacob 1, Joseph 2, Julia 2. Benjamin got total of 7. I did a total of 12 with a light 3 mile tempo run on the way back in 16:36 - 5:36, 5:34, 5:26. Maybe too fast given the plan to run hard tomorrow, but I figure if I can do 2x3 in one day, why not 3 one day, and 3 the next? A.M. Ran with Chad and Benjamin. Total of 20.5 for me. We did a time trial of sorts on my 3 mile course (Nuns Park to mouth of the canyon). Benjamin and Chad started together, with me starting one minute later and trying to chase them down. I failed again, although it was not as bad as two weeks ago, as I ran faster. I did 5:12, 5:21, 5:18 - 15:51 total. I did obviously have some quarters over 80 :-). The one before the second mile was 82, and the one after that was 81. Then I kicked into gear again. But I was obviously struggling. Possibly the fatigue from the weight running and the pickup yesterday. In any case, I was not too displeased with this result. Benjamin and Chad ran together for the first 2.5 with the splits of 5:24, 5:34 followed by 0.5 in 2:49. Then Benjamin took the lead, and ran the last 0.5 in 2:39 finishing in 16:26. Chad finished in 16:36. Both got records for this course. Benjamin was only 35 seconds slower than me. I think he will be competitive against me in the Thanksgiving 4 miler this year. Not bad for a 13 year old. Then we ran to the house to drop off Benjamin, which gave him about 7.5. Then 1 mile with Joseph, and back into the canyon to finish the run and get the car. Jenny did 3, Julia and Joseph 2, Jacob 1. We ran at about 7:30 - 8:00 pace all the way almost to the Vivian Park, then turned around and ran back to the Canyon View Park where we parked the car. I ran the last 4 miles in 22:30 with the splits of 5:47, 5:35, 5:34, 5:34. I was trying to beat Chad's time for 3 in my last 3, but fell short - 16:43 vs 16:36. I did have some good excuses though - it was at the end of 20, and it was getting warm. Then I jogged back about a quarter, met Chad, and finished with him. Day of rest. Went to church. We had another return missionary couple speak in the Sacrament meeting. Our stake is very good at sending out missionaries, both young and senior. Then we had a Sunday school lesson on prayer, and a lesson in the Elder's Quorum on Sabbath day worship. A.M. Ran with the kids. Jenny did 3.5, William 0.5, Joseph and Julia 2, Jacob 1, Benjamin 7. Did 2 of it with the weights. Added enough to make the total 12. Did a pickup for 0.5 uphill in 2:56. A.M. Ran with the kids, then some alone. 2 miles with weights. Jenny did 3.5, Benjamin 7, Joseph and Julia 2, Jacob 1, William 0.5. I did a pickup for 0.5 down the canyon in 2:33. A.M. Ran with the kids, and that was most of my run even though I did a total of 12.3. Did 7 with Benjamin, 2 with Julia and Joseph, 1 with Jacob. 1 of them was with weights. Jenny did 3, including 0.5 with William. Benjamin and I did a pickup for 600 in 1:45 down the canyon. This is actually Benjamin's PR for 600. P.M. 5 miles with Julia and Joseph following me on a bike. I prayed on Saturday to know what I should do with my training, and a thought, a good one, came to me that I needed to do what I could to squeeze in a moderate amount of doubles. Today was the day when I managed to squeeze in another run. Joseph and Julia kept up fine, in fact, 7:30 pace, which is what I ran, was too slow for them. A.M. Ran with the kids and a little bit alone. Total of 12. Benjamin did 7, Jenny 3.5, Julia and Joseph 2, Jacob 1. Benjamin and I did a pickup for about 0.5 at around 5:40 pace. I ran 2 miles with the weights. Julia rode the last two miles with me on her bike as well. P.M. 5.3 miles to the canyon and back in the dark. A.M. Today was another day of mile records. When you have a large running family you can say that. Somebody is always breaking a record. So today Julia ran the full mile (1609.34 meters) on the track in 7:00.9. That is a PR by 22 seconds. Her splits were 1:42, 1:47, 1:48, 1:40 and 3 seconds for the extra 9.34 meters. So by the high school standards she is a sub-7:00 "miler", as their mile has only 1600 meters. Julia ran total of 3 miles. Jenny did 3, Jacob 1, and Joseph 2. Benjamin also set a record. To help him mentally prepare for breaking 5:00 mile on the track I thought it would be a good idea to break it on the trail first going down the Provo Canyon, which is about 1% grade. I consider that mile to be roughly equivalent to the ideal track mile. Orem High is not ideal because the track is exposed to the canyon wind, so it is more than honest. So in the middle of our regular 7 mile run we did a mile time trial. The plan was for Benjamin to lead the first 500, then I take over and take him to 1100, then he passes me and kicks while I keep the pressure from behind. We executed the plan almost perfectly - the only mistake was he hit the first quarter in 76 instead of 73. But we made up the time later. Our splits were 76, 73, 73, 70 with 4:52.5 for Benjamin and 4:52.7 for me. Having a son go sub-5:00 I suppose is a milestone, pun intended. It is quite exciting that his time was only 10 seconds slower than my best time ever on that course while he is only 13. This is to be expected, though. He has my genes, he has been trained from the age of five with me using all of the experience I gained over the years, he was delivered naturally and breastfed for about a year (then Jenny got in the queue and cut off the milk supply), has consumed very little if any junk food in his entire life, and does not have a congenitally defective spine. His drive to win is strong, and he is committed to doing what it takes. So with the above you would expect the son to outperform the father by quite a bit. It is however one thing to reason about why your son should be fast, and it is something else to actually witness him get fast and realize all those hopes. I am well aware that many fathers have reasoned legitimately why their sons should be fast, but only a very small fraction of them have had those hopes come to fruition. So I do not take this blessing for granted. This mile felt very close to all out for me except for the first quarter, which felt like a jog. But then when I had to lead hitting 73s it was hard. But once Benjamin took over I recovered and felt strong in the kick. I even considered passing Benjamin and trying to outsprint him, but he boxed me to the edge, and I figured if I moved to the other side to pass he might instinctively shift, which would make him slower, plus I was tired enough already. My competitive drive was satisfied by just not getting dropped. I did, however, get my fastest time of the year, and I was happy to have been able to do it with a 6 second negative split. We ran home, then I ran one more mile with Julia on a bike. Total of 12. A.M. After the problems at the actual Provo River Half marathon I began to wonder I had issues in the area of half-marathon endurance that were more than just a hurt rib cage. So I decided to repeat the race, this time "uneventfully", or in other words completely alone. I took the first and the last place with the time of 1:13:02, and am generally happy with the effort. This was 1:46 faster than in the actual race, so it does show that the rib cage problem was a significant drag two weeks ago. I was sluggish at the start. First mile (going off race mile markers) was 5:19, followed by 5:23. At this point I was 5 seconds behind my pace two weeks ago. The 4 mile split was 21:32, so 5:25 average for the next two miles. I knew I was running slow for the generous 3 % grade, but I could not get myself to go faster. It did not look slow to the people I was passing, and they were quick to comment, but it was still slow. It is all relative, I suppose. Once I got out to the less steep grade, however, I maintained the pace better than I thought I would. I timed a 5:33 mile on the markers. After the first 4 miles, the official markers on this course go a bit wild, so it would be more reliable to keep track by the land marks - those do not move. My split at the letter S at the start of the uphill was 35:28. A mile later at the mark that said 16 it was 41:51 (6:23). 42:28 at the turnaround. 43:01 back at the 16 mark. 48:27 back at the letter S (5:26 mile). 49:32 at the start of my 3 mile tempo course in Nunn's Park. The next 3 miles were 5:29, 5:31, 5:33 - 16:33 for the 3 mile tempo course, which gave me 1:06:05 split at the end of it and 56:08 at what looked like the official 10 mile mark, which is fairly accurate. 1:08:52 half a mile later on the triangles mark, 2:47 for the half mile. I forgot for a moment that I was running the Provo River Half, and not my 10 mile tempo back to the house, and did not cut the corner near the press building. That probably cost me 3 seconds, which unfortunately ended up putting me over the 1:13 barrier. 1:10:01 at the start of the Riverwoods trail right as you cross the bridge. My overall take from that run is that I know how to hold 5:30s for a while on anything ranging from 0% to 2% downhill quite well, I can hold it fatigued, but I have a hard time sustaining sub-5:20 pace on any grade, even 4-5% downhill. The limiting factor seems to be this strange thing that I have observed before. Being aided by gravity allows you to, more like forces you to, increase your leg turnover. As your leg turnover increases, your brain starts thinking you should breathe more frequently, when in fact, you can do just fine without it. When you start to breathe more frequently that triggers the response "this pace is not sustainable because I am breathing too hard". I call this the "downhill respiratory panic". There is a cure for it - fast downhill tempo runs or long intervals, which I will do in the next couple of weeks. Ran a long cool-down to make the total 20, some of it with Benjamin. Benjamin did 7, Jenny 3, Julia and Joseph 2, Jacob 1. P.M. William finally broke 2:15 in the 400 meters at Orem High track. No hand holding. His splits were 28, 33, 35, 37 - 2:12.8. He earned himself a watch, which I ordered the same night. Joseph tried to break his record in the 200, but in his first attempt he tripped. at around 150 meter mark. He tried again, but was too tired running 40.4. William's total for the run was 0.5. I ended up with about 0.7. Day of rest. Went to church. My mind is drawing a blank on the subject of the Sacrament meeting talks. That has been happening more often on things where I should not draw a blank. So either it is a sign of aging (I am 39 after all), or perhaps the mind can actively retain only so many memories, and eventually something has to give. I did remember the Sacrament Hymn, however - O Savior, Thou Who Wearest. I heard it for the first time about 10 years ago, or perhaps that is the first time I paid attention to it enough to learn some about its history. The music is very old, it was written originally by Hans Leo Hassler in the 1500s, then later adapted by Bach. But the words we sing in our church were not written until the 20th century, and the author is Karen Lynn Davidson who taught English at BYU. I have always felt that the words that we sing are the right words for the melody, and I am quite impressed that it took 400 or so years to find them. I am also impressed that those words were found not by some famous poet, but by a humble sister that I might find myself sitting next to in church and not think much of her. Just another member of the congregation. Not quite! To find those right words we needed somebody who had the advantage of the increased understanding of Christ's Atonement which came through modern day revelation, and who also had a literary talent to be able to express it. And that is not all. Without the help of the Holy Ghost those words could not have been written. That hymn from time to time comes to my mind during a hard workout. It is comforting to know that Christ has overcome the hardest thing there is to overcome, and because of that we have the ability to overcome hard things through Him. When that hymns comes to me it is a very special feeling - I feel support from some source invisible to the natural eye, but nevertheless real. It may not speed me up by a minute per mile, I always wanted it to and wondered why it does not, but as I've matured I understood that is not part of the plan. It is not about achieving speed, it is about having a vision to overcome and fly. Whether it is a 6:00, a 5:00, or even a 4:00 mile it is still a pedestrian crawl even compared to a bike much less an angel, but regardless of how slow it is, if you achieve it by looking upward with faith, the Lord sees that you want to fly, and that is what He wants to know. A.M. Ran with the kids. Benjamin did 7, Jenny 3, Julia and Joseph 2, Jacob 1. I did total of 12, including 2 with weights. A.M. Benjamin and I attacked the 5:00 mile barrier at Orem High. Neither of us had the juice today to break it - we ended up with 5:03.7 for him and 5:04.2 for me. He can now drop me in the kick. He led the first lap in 75, then I took over at 500 and brought him to 800 in 2:29 (74). So far so good. But on the third lap I did not have the juice to deal with the headwind and botched it quite a bit - 3:47 (78). Benjamin took over at 1100 as planned and tried to kick. I tried to help him, but we were both rather sluggish and could only manage a 75 for the last lap. But still Benjamin improved his track mile PR by 5 seconds. Then we paced Jenny. It has been a while since she even tried to set a mile PR. She has suffered from a growth spurt that gave her a good amount of muscle and joint pain along with cardiovascular underperformance. So her old PR of 6:52 she set 3 years ago never got broken since. It was now time to kill the beast. The plan was to take her through the first two laps in 1:40 each, and then see what happens. We instructed her to not doubt our pacing and maintain contact even if she thought all she could do at that pace was take one more step. That seemed to work - she trusted our pacing and got a new PR of 6:42.8. The splits were 1:38, 1:42, 1:43 and 1:36 with the rest of the total time going towards the additional 9.34 meters. Then we ran another mile, which made it 7 total for Benjamin, and I went for 5 more with Julia and Joseph following me on their bikes. I was mad about that 5:04, and the kids were anxious to go faster, so I did a mini-tempo to release the fumes running the last 2 miles in 11:20 (5:33, 5:47 uphill). Total of 12 for me, Benjamin did 7, Jenny 3, Julia and Joseph 2, Jacob 1, William 0.5. A.M. Did a mile time trial with Julia at Orem High. With all of the kids it seems like I am doing time trials all the time. She wanted a rabbit, I told her she had to break 7:00 to get one. She tried last week, but missed it by 0.9, all of which came from not trusting my pacing and falling back when the pace got hard. So I instructed her this time repeatedly to trust my pacing, and made sure she understood that if she wanted to run sub-7:00 she could not afford to doubt at any point - the mile is just way too short for that, you sneeze, and you are hopelessly off pace. The plan was to go 1:42, 1:42 then try not to lose ground on the third lap, and kick in the last. We did 1:41, 1:44, 1:48 and 1:40 for the last lap with the total time of 6:55.7. This brought the count of sub-7:00 milers in the family to 6 out of 9: myself, Sarah, Benjamin, Jenny, Julia, and Joseph. The only three that have not done it yet are Jacob, William, and Stephen. They all have a good excuse with the six year old Jacob being the oldest. Got home, ran with the other kids. Benjamin did 7, Jenny 3, Julia 3, Joseph 2, Jacob 1. I ended up with a total of 12, 2 with weights. P.M. 0.5 with William, 4.5 with Joseph and Julia on bikes, Joseph did a few surges, and I followed, thus about a mile at marathon race pace. A.M. The kids ran on their own today, Benjamin was in charge. He ran 7, Jenny 3, Julia and Joseph 2, Jacob 1. I did a workout in the canyon. The purpose was to kick the "downhill respiratory panic reflex". So the workout was 3x1 mile down the steepest sections of the Provo Canyon I could get to within reasonable time from my house. The first interval was on the old highway from the 16 mark to the S mark. I did it in 5:02.1 compared to 5:26 in the Uneventful Provo River Half. Then I jogged 600 meters and did another one in 5:04.8. The same mile in the Uneventful was 5:29. Then I jogged 1300 meters and did the last one. I felt I was getting tired, and it also had less of a downhill (5:33 split in the Uneventful), so I was thinking it would be good to break 5:10. But I decided to do the first quarter in 75 anyway and see how long I could last. To my surprise, I pretty much lasted all the way with 5:01.2 split. I tried to break 5:00, but did not have the juice. I was actually quite surprised because I did it in 4:52 fresh racing Benjamin last week, and this time alone and with it being the third mile it was not that much slower. Overall this was a good workout. It taught me to not panic when the breathing gets hard and just push through it. I will repeat it next week. Total of 13 miles. P.M. Julia ran 0.3 with William. A.M. Jacob did a mile time trial today. He said he wanted to break 7:00. His PR was 7:27, it was only a month old, and I thought it was a pretty strong PR. I was quite impressed by his faith. I told him we would start on pace, and then see what happens, and that I would be very happy with 7:15. In the first lap he was actually a little hesitant and we got 1:47. Then he sped up to 1:45. His third lap was a bit of a struggle, but not too much - 1:48, and he found some juice in the last one to kick in 1:46. His time was 7:09.8. I was quite happy with that - he is only 6 years and 1 month old. Then I ran with the other kids Benjamin did 7, Jenny 3, Julia and Joseph 2. 2 with the weights. Ran some more alone - total of 12. P.M. 0.5 with William, 4.5 more alone - total of 5.